“You have waited for all this time for 30 to 40 years and I would like to thank you for your patience, Minister Thomas said in his speech during the citizenship award ceremony. “The time has come and I am pleased on behalf of the PNG Government to formally recognise you as PNG citizens”. The Minister for Immigration and Border Security Hon. Petrus Thomas, MP has awarded PNG Citizenship to 62 West Papuans residing in Vanimo on Thursday 01 November 2018. 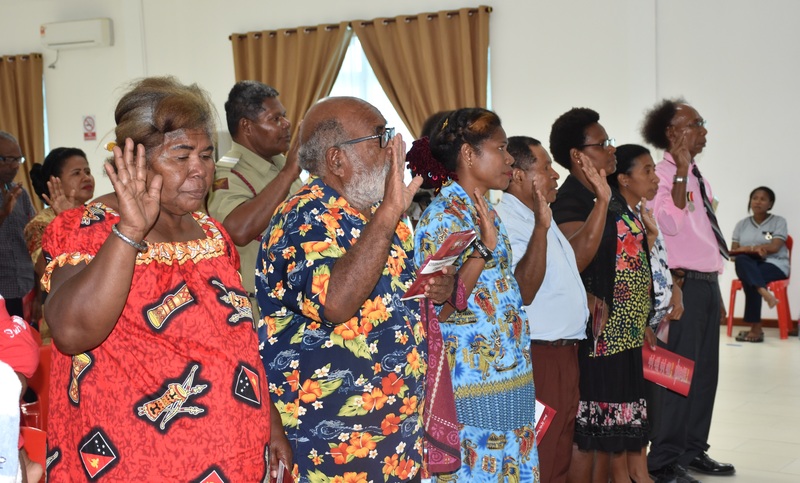 The awarding of 62 citizenship to West Papuans in Vanimo brings the total number of former West Papuans (now PNG Citizens) to 1352 since the Immigration and Citizenship Authority (ICA) started the process of registration and citizenship for West Papuans in 2017. Whilst waiting one of the recipients Ms Maria Hassor passed away and her husband received her certificate. One of the proud recipient Mr Willam Braber and his wife were also recipients of the citizenship award. Mr Braber spend 51 years in PNG and taught as a high school teacher and school principal for 43 years. Mr Braber who represents the recipients said that they still have a lot to contribute to PNG and will work, live and die in this country. The recipients attended the ceremony with their families and friends. West Sepik Governor Hon. Tony Wouwou in his speech thanked the government and Immigration and Citizenship Authority for recognising the West Papuans who have lived and contributed immensely to West Sepik Province. The Immigration and Citizenship Authority (ICA) will continue to register West Papuans living around the country and encourage those in other provinces to contact the Immigration office to register.